Isaiah Bowser celebrates a touchdown in Northwestern’s game against Wisconsin. Bowser has become a celebrity in his hometown of Sidney, Ohio. 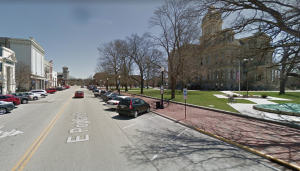 Sidney, Ohio, is a small manufacturing town nestled amidst mile upon mile of farm fields in western Ohio, 40 minutes from Dayton for fast drivers and more like an hour for slower ones. It’s an all-American town in many ways: a courthouse at the center, a historic theatre a block away, a few chain hotels off the two interstate exits along the edge of town. About 21,000 call it home, many of whom work at the Emerson plant in town, or the Honda plant a short drive north. And its football loyalties have always been clear: yellow for the Sidney High School Yellow Jackets, and red for Ohio State. But now there’s a new team in the mix. There’s one man causing all the ruckus: Isaiah Bowser. Last autumn, Bowser was concluding an illustrious career at Sidney, rushing for 2,617 yards and scoring 32 touchdowns his senior year. This year, he has rushed for 483 yards in just the past four weeks and helped the Wildcats (6-4, 6-1 Big Ten) clinch a spot in the conference championship game. Certainly, Bowser’s life has changed dramatically, as Inside NU wrote this week. Yet the fate, spirit and community of Sidney itself has also changed dramatically, reviving interest in a school — and a team — that quietly, simultaneously, had fallen on hard times. Less than a decade ago, Sidney was in trouble. The Great Recession hit the blue-collar manufacturing town particularly hard: the unemployment rate jumped to nearly 14 percent, and the city’s tax revenue dropped almost 20 percent. An emergency tax levy for the school system in fall 2009 passed by a single vote out of 8,903. Things weren’t much better on the field, as the Yellow Jackets went 7-33 between 2008 and 2011. There was so little funding for the football team that players’ families had to pay to keep it going, said Cara Stockton, the mother of one of Bowser’s childhood friends. “Many people ran away from Sidney, whether because of our football program or our school district,” said Adam Doenges, the head coach since 2011. The economy improved significantly in the time that followed, but the football team did not follow suit, and entering last autumn, still had not made the Ohio state playoffs in 27 years. Then Bowser, a promising multi-position player over the prior two seasons, exploded to catalyze one of the best seasons Sidney had ever seen. He almost single-handedly won several games, including a 55-48 shootout victory over Xenia in which he ran 41 times for 413 yards and six touchdowns. The Yellow Jackets went 9-1 as a result and, at long last, made the playoffs. Sidney fireman Jason Truesdale’s daughter, Hallie, was the team’s kicker. She broke a school record by making 58 extra points on the season. Yet Truesdale knew her accomplishment was partially enabled by someone else. Prior to Sidney’s first playoff game in three decades — a 46-33 home win in which Bowser ran for 228 yards and four scores — the entire town threw a pep rally for the Yellow Jackets, marching them from that historic theatre down the block to the steps of the historic courthouse, Stockton said. Prior to the second playoff game, a road contest that Sidney lost, residents lined the main street leading from downtown to Interstate 75 to cheer on the team buses. The effect has lingered. In elections last week, Sidney’s school tax levy was passed again, not by a single vote but with over 61 percent in favor, and several residents said they thought it was because of increased interest in the high school. But for as much as Yellow Jacket fever has overtaken Sidney, Bowser fever has proven even more contagious. Foy isn’t the only one watching. Doenges said he and the entire Sidney coaching staff left at 5 a.m. to drive to Ryan Field for the Wisconsin game, watching Bowser tote the rock 34 times in a NU upset win. 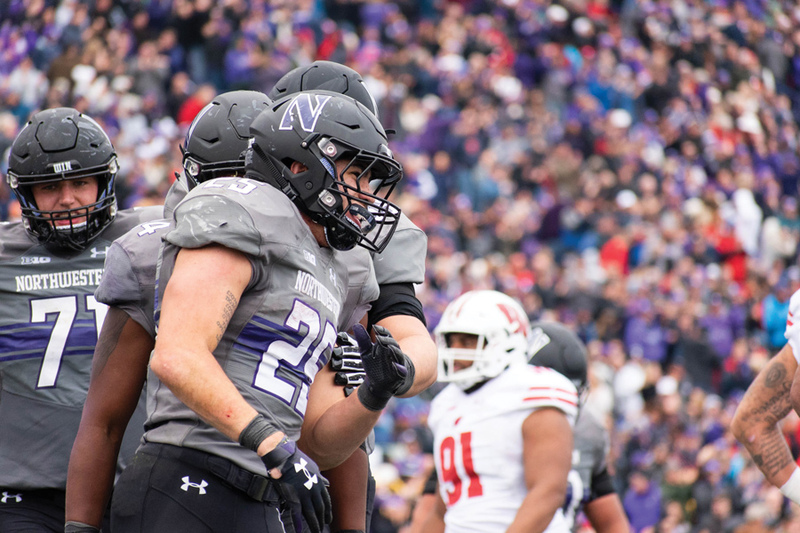 Barhorst, a diehard Buckeyes supporter, said he lately has asked, per usual, “When is Ohio State on?” but always quickly followed it up with, “And when is Northwestern on?” He can rattle off the story of the Bowser’s season in Evanston with ease. And Truesdale, also a huge Ohio State fan, said he hears not about the Buckeyes but rather the Wildcats at the fire station now — “even from the guys who aren’t football guys,” he adds. So far, the town — outside of particularly dedicated efforts such as Doenges’ pre-dawn road trip — has been only able to watch Bowser’s college football takeover from afar. But even that is going to change soon. After the Cats’ win over Iowa last Saturday, clinching their spot in the Big Ten Championship on Dec. 1, Doenges made a “lighthearted” suggestion on Twitter that Sidney residents book tickets for the game in Indianapolis, only a two-hour drive away. The next time he checked his phone, he found it bombarded by texts, calls and direct messages asking where people were planning on sitting. The roots of a Sidney-Indianapolis pilgrimage, now believed to be over 100 people strong, had begun to take hold. Foy is going. Barhorst is going, too. Stockton is going, as are her kids and her parents, she said. Truesdale is hoping to also go, if he can get out of a fire instructor class he’s supposed to teach the next day. In the middle of Ohio State country and the Midwest’s rural agricultural belt, Sidney, Ohio, has been rallied by a sport, a team and — perhaps most notably of all — a single 19-year-old man, powering for yard after yard in crucial games around the Big Ten. And now Bowser fever is spreading.